For the South African cricketer, see Jean Marais (cricketer). A native of Cherbourg, France, Marais was a son of Alfred Emmanuel Victor Paul Villain-Marais and his wife, the former Aline Marie Louise Vassord. He was discovered in 1933 by filmmaker Marcel L'Herbier who purchased one of his paintings, then cast him in two films L'Épervier and L'Aventurier. Marais starred in several movies directed by Jean Cocteau, for a time his lover and a lifelong friend, most famously Beauty and the Beast (1946) and Orphée (1949). In the 1950s, Marais became a star of swashbuckling pictures, enjoying great box office popularity in France. He performed his own stunts. In the 1960s, he played both the famed villain and the hero of the Fantômas trilogy. In 1963, he was a member of the jury at the 3rd Moscow International Film Festival. After 1970, Marais's on-screen performances became few and far between, as he preferred concentrating on his stage work. He performed on stage until his eighties, also working as a sculptor. 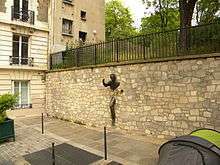 His sculpture "Le passe muraille" (The Walker Through Walls) can be seen in the Montmartre Quarter of Paris. His life story became the inspiration for the 1980 François Truffaut film The Last Metro. In 1985, he was the head of the jury at the 35th Berlin International Film Festival. He was featured in the 1995 documentary Screening at the Majestic, which is included on the 2003 DVD release of the restored print of Beauty and the Beast. Marais appears on the cover sleeve of The Smiths single This Charming Man. He was married for two years to the actress Mila Parély, with whom he later performed in Cocteau's Beauty and the Beast. Marais, who was homosexual, was the muse and lover of Jean Cocteau until Cocteau's death. After Cocteau's death, Marais wrote a memoir of Cocteau, L'Inconcevable Jean Cocteau, attributing authorship to "Cocteau-Marais". He also wrote an autobiography, L'Histoire de ma vie, published in 1975. From 1953 until 1959, his companion was the American dancer George Reich. In the early 1960s, Marais learned that he had a biological son, Serge Ayala, whom he recognized in 1962 and who eventually took the name Serge Villain-Marais. This son, who became a singer and an actor, committed suicide in 2012 at age 69. Marais died from cardiovascular disease in Cannes, Alpes-Maritimes, in 1998. He is interred there at Vallauris cemetery. ↑ Shelokhonov, Steve. "Mini-Biography". Internet Movie Database. Retrieved 11 March 2012. 1 2 3 Trambouze, Claude. Jean Marais : Un Homme aux milles. PORTRAIT (in French). Retrieved 11 July 2015. ↑ "3rd Moscow International Film Festival (1963)". MIFF. Retrieved 11 March 2012. ↑ "Berlinale: Juries". berlinale.de. Retrieved 1 August 2011. ↑ Shelokhonov, Steve. "Mini-Biography". Internet Movie Database. Retrieved 11 March 2011. Wikimedia Commons has media related to Jean Marais.